Andrei Tarkovsky, famous in the West for SOLARIS and STALKER and celebrated with numerous awards, was not too popular with the ruling class of the former Soviet Union. In twenty years, he was only allowed to make five films in his own country. His official recognition came posthumously, when a plaque in his honour was unveiled in Moscow in 2000. With this symbolic scene, popular television journalist and film-critic Pjotr Šepotinnik begins his video-essay about the Russian filmmaker. POSLE TARKOVSKOGO is no conventional biography of an artist, but a series of associative reflections on his works. It is also a thoughtful homage. Among others, we hear from Tarkovsky’s favourite actor Oleg Yankovsky (NOSTALGHIA), his son Andrei A. Tarkovsky, his director of photography Vadim Jusov (SOLARIS) and Tonino Guerra, who contributed to the screenplay for NOSTALGHIA. 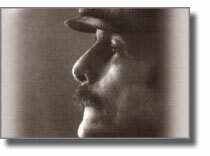 Their personal recollections and anecdotes comment Tarkovsky’s works with regards to several selected scenes. It becomes clear that Tarkovsky – who did not own a phone and often had to depend on colleagues for cab-fare – met with immense opposition. The film also sheds new light on the religious motives that were a source of inspiration for the director. The sublime tranquillity of his images, which became progressively closer to paintings and explored the futility of existence, mirrors his lifelong search for an “authentic faith”. Pictures from the archives of Pjotr Šepotinnik and Chris Marker show him in Paris, shortly before his death.